The AGM and lunch in Leeds in October 2018 prompted new material into the Archives! Walter Lewis has scanned material sent to him and we can share it here, below, as well as depositing it safely at The Institute of Education in London. ​Our archivist - Wally Lewis - has dispatched two full record boxes to IoE in July 2018. Click on the link above to see what treasures were included. If you have anything that you think might be useful for future generations, please contact Wally via this site. Wally can advise if you are not sure! The Association's archives are housed at the UCL's Institute of Education (IoE), the largest institution in the UK devoted to the collation and study of education and related matters. Amongst their important collections are our papers of the BFES/SCEA Association. As artefacts memorabilia, memories and photographs are received we annotate and add to the collection. It is managed, catalogued and listed on line by professional archivists, led by Sarah Aitcheson, at the IoE. 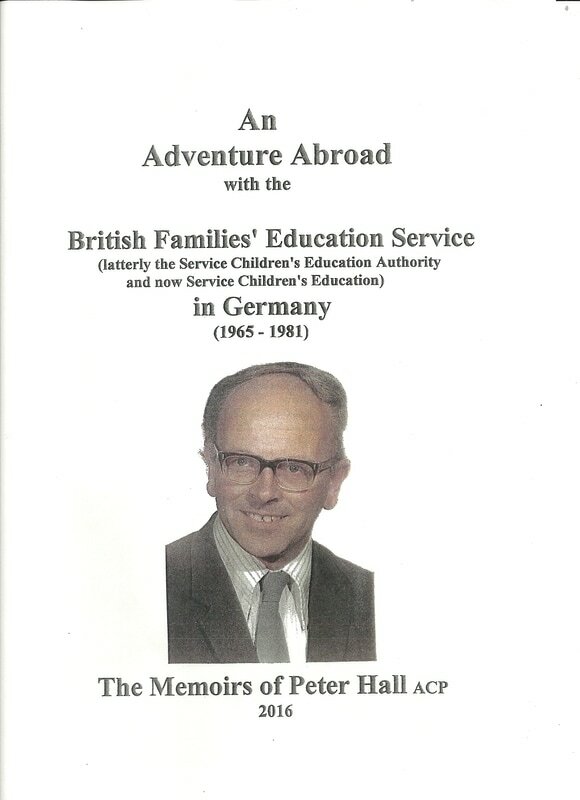 This dynamic collection is the sole record of present and past educational provision for the children of British Service families abroad, since BFES was established in 1947. The Headmaster informs me, that with thirty continuous years' service with SCEA, I am the longest serving teacher in the history of that organisation. If the is is true, I can only say the years have flown. It seems like yesterday that my wife Dana and I with our two year son were awaiting with some trepidation (out first long haul), along with a few other new recruits we had met at the Eltham Briefing Conference, the departure of our turbo-prop aircraft which would take us in twenty-six hours via Kuwait and Colombo t the distant and mysterious unknown of the Far East. 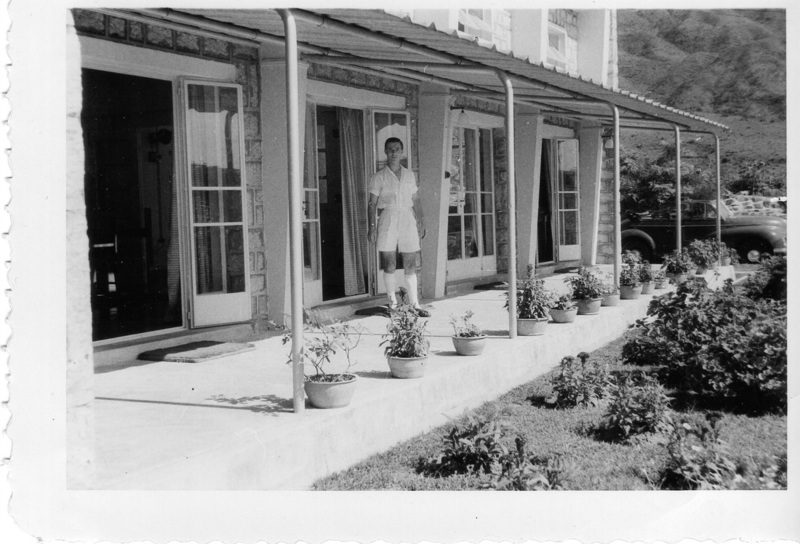 A last minute panic - our local doctor had not given our son the vital injections against yellow fever and cholera. So a mad dash across London to Millhill BMH. A while later, I consigned my old raincoat to the rubbish bin (I have never replaced it) and we boarded our plane for the start of a new life. Having whetted my linguistic appetite on Malay, Singapore now presented the opportunity to try a more difficult 'tonal' language - Chinese. Opportunities and materials for study were meagre as Mandarin was not promoted by the government of Mr Lee Kuan Yew at that time, though it has since become an official language of the city state. Nevertheless, I persevered and embarked on a task which has frustrated and given me moments of joy and insight ever since. But I was now of an age when I should begin to think of resettling in the Uk. After all, SCEA policy did not offer a full career, and expected staff in their forties to look elsewhere. Then in 1986, just after the IRA car bomb which rocked Rheindahlen Garrison and shattered a lot of windows, fortunately without causing serious injury, a conference was held on the new GCSE examination. I learnt from the Headmaster visiting from St. George's School, Hong Kong that the Languages post would be vacant from June 1987. I was fortunate enough to be offered this post initially for two years, but with changing policy and impending closure in July 1996, extended to that date. This gave me the chance to further develop my interest in Chinese and to teach the subject to GCSE level over the past nine years, mainly to Japanese, Cantonese and Korean speakers, but also to the occasional brave Westerners. Here are some pictures of the supplies that arrived from Germany to Shin Kalay school. 5 large bench type chairs, 16 small kindergarten chairs, Tables, Cabinet for children storage supplies, Coat hunger stand. Office supply long plastic cover mattresses. Lots of books for children many other small items. Thanks to all of those who took in this great mission. We all are very thank full to every thing. this was a wonderful thing to happened. thanks again. Mohammad. 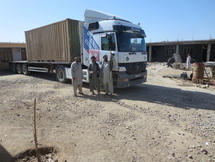 Excess furniture and children's books from Ark School (JHQ) were legally donated to the Shin Kalay School, Afghanistan. Ark closed in 2013 and finding a legitimate means of donating was a challenge. 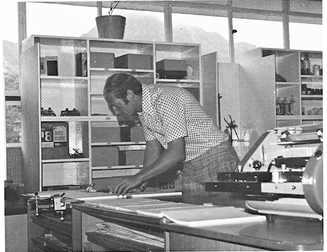 Mike Chislett (HT) arranged the donation and storage of the items in Ark's empty building, but the task of moving them was solved by Tom Nielsen-Marsh, who retired from HQ SCE only a few weeks later. Thank you, Tom! The Andrew Humphrey/Blankenhagen School Gutersloh closed in July 2016. Below are three photographs, taken from a large collection of material since deposited at the IoE. 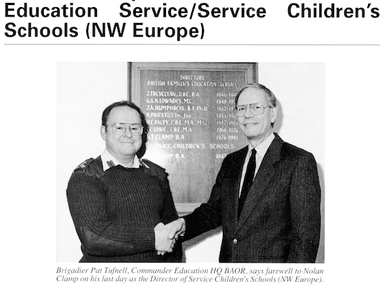 Past President of our Association, Nolan Clamp, with Brigadier Pat Tuffnell, Commander Education HQ BAOR, on the occasion of Nolan Clamp's retirement in March 1991. Nolan had been Director of BFES for 15 years. 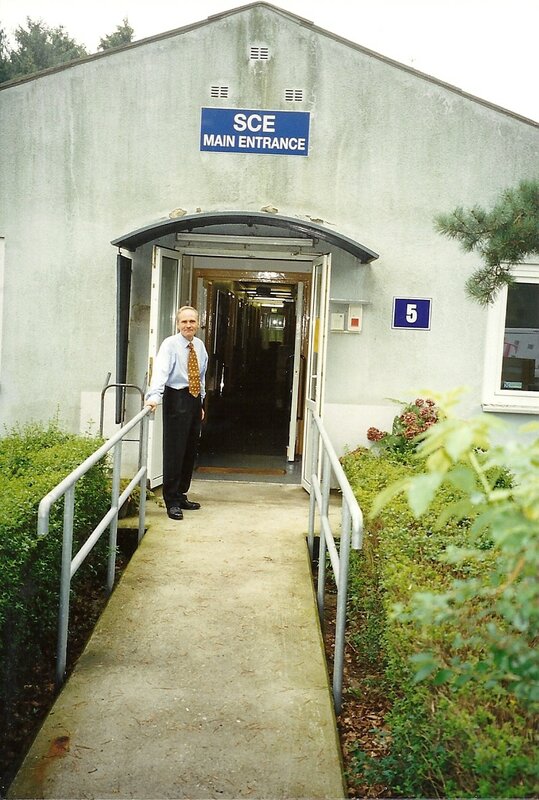 Before joining BFES as Deputy Director to Eric Lowe in 1972; Nolan had served in the RAF in the 1950s and subsequently became Deputy Director of Education in Burton-on -Trent. He retired as President of the BFES/SCEA Association in October 2015. Operation Union - British Families route to join their military husbands stationed in Germany in 1946. 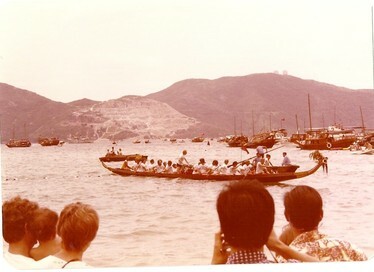 SCEA teachers entered in Hong Kong's Dragon Boat Race 1976. Can you identify any other pupils in this photograph? King Alfred School, Ploen, Reunion: 10th January 2015: Bloomsbury Hotel, London. 102 ex-pupils attended this event. 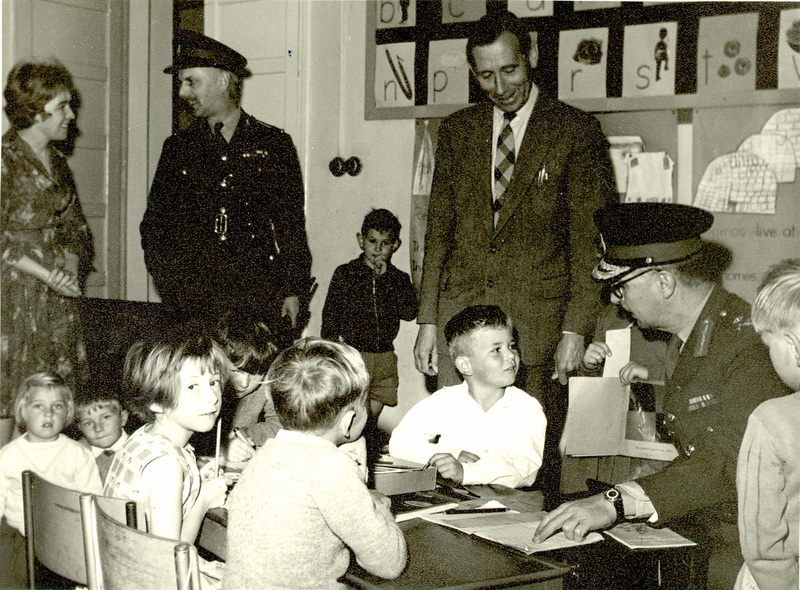 Lt Col Paul French, seen above addressing the members recently published the book, "BAOR Boarding School 1948 - 1959. It is a fascinating account of the life and times at King Alfred School, Ploen. The hardback book costs £19 and all monies go to the charity "The Not Forgotten Association". A copy has been donated by Paul for our Association's Archives and he has given his permission for us to use some of his material on our web-site. Below are some of his illustrations. 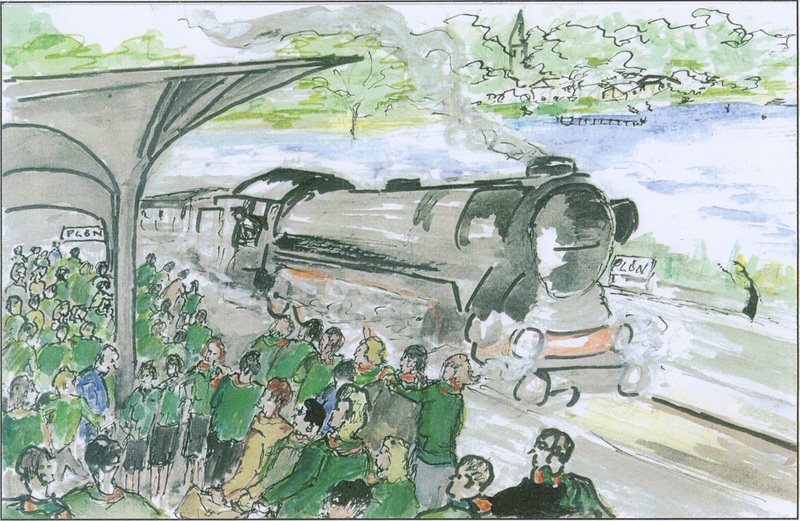 Pupils wait as the school train steams into Plon station. The Girl in a Red Blazer . Middle Schools were one of the Government's better educational concepts and BFES took to the notion with enthusiasm in the early 1970s. 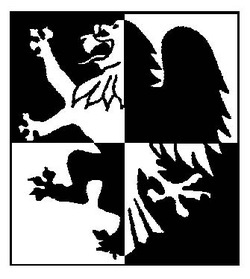 Middle Schools, catering for the education of children aged 9 to 13 were purpose built and opened in RAF Bruggen (Cheshire Middle School)RAF Laarbruch (Rhein Middle School), Dusseldorf (Dalton Middle School), Sennelager (John Buchan Middle School) and Hohne (Heide Middle School)..
RAF Bruggen, later to become Javelin Barracks, Elmpt. 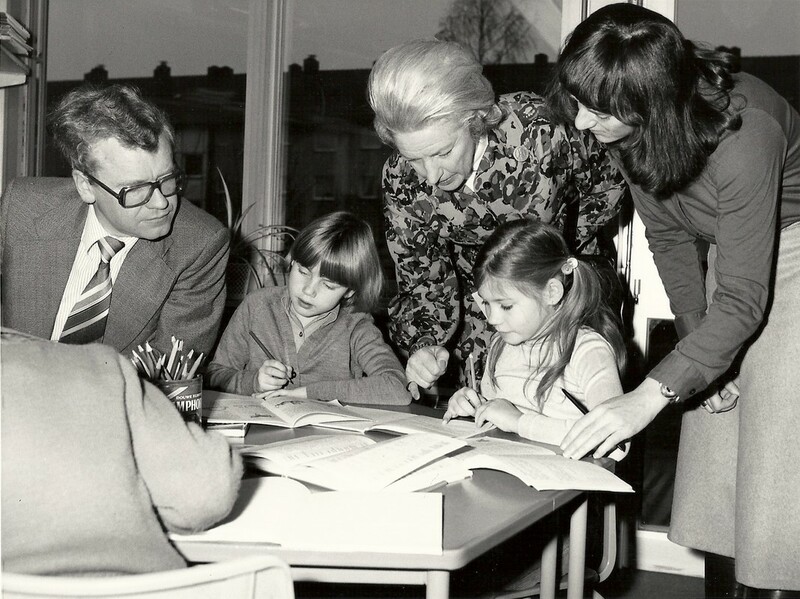 The original, 1960s Bruggen School became Barnes Wallis First School in the 1970s when Bader First School and Cheshire Middle School were built and opened. 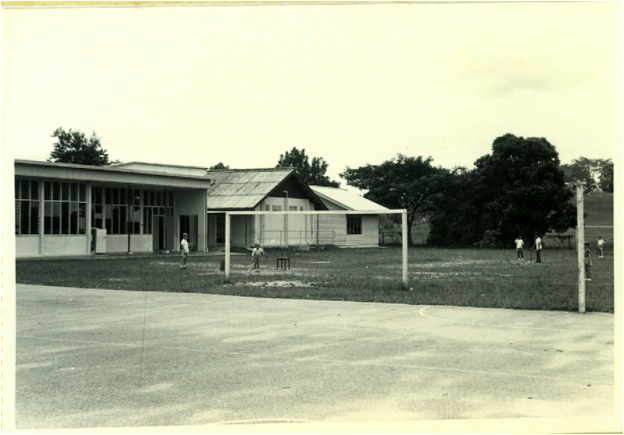 In the 2000s the more modern schools were demolished and the original returned to its name of Bruggen School. Eventually closed in 2014. Lynda, ?, Pat Williams (Deputy), Peter MacDonald-Pierce (Head), Wally Lewis, Barbara..
Kent Comprehensive School, Hostert - near JHQ Rheindahlen. 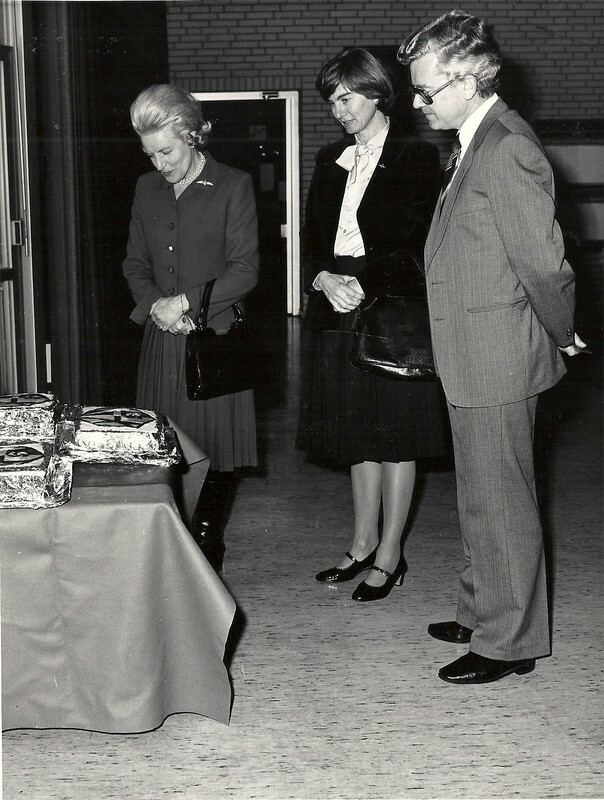 The school closed in 1987 when it amalgamated with Queen's School, Rheindahlen at the latter's site in Rheindahlen. These photographs are from the early 1980s - note the BBC B computers! 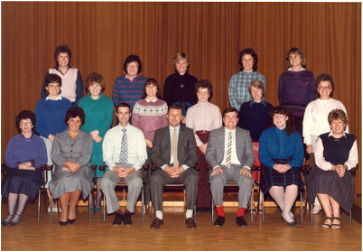 SCEA Secondary Headteachers' Conference, March 1982. For the first time since 1977 Headteachers from SCEA Secondary Schools in Germany, Cyprus and Hong Kong came together at the Headquarters Mess, RAEC, Eltham Palace. 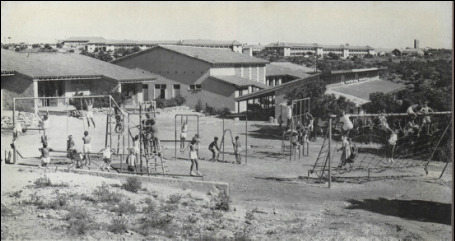 St George's Secondary School, Hong Kong, was located in Kowloon Tong, off Waterloo Road, and, at one point, educated 950 children. It closed in 1996, prior to the hand-over of the Colony to China in 1997. "In June 1946 Government made the decision that children should join their families as along as the education they received was at least equal to that they would have received in the UK". "Memories Of Sek Kong School" booklet, produced to mark the closing of the school and of the colony in 1997. 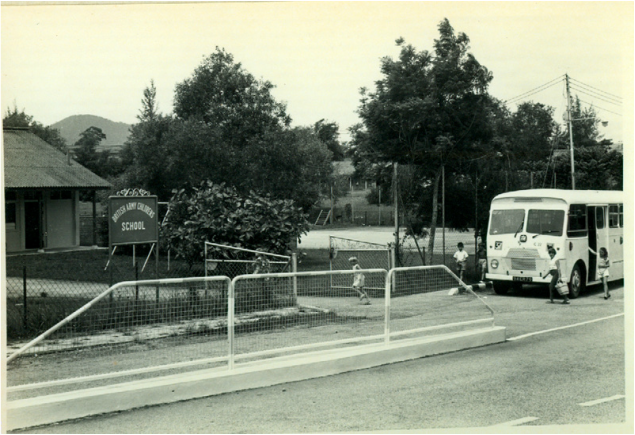 Sek Kong Primary School was located in the middle of the New Territories element of the colony of Hong Kong. 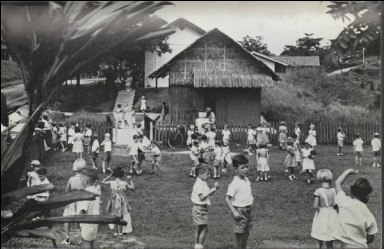 The School provided the education for 4 to 11 year olds whose parents lived and worked in the barracks/airfield around the Sek Kong area. 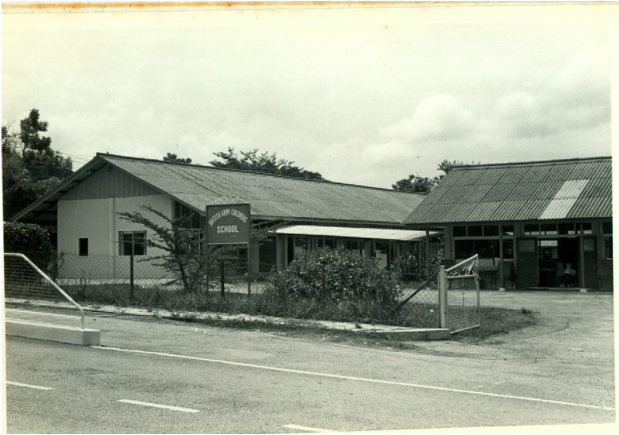 The Gurkha garrison, also located around Sek Kong had its own school for some of the years.Single teachers were accommodated in a Teachers' Mess, part way down the hill into Sek Kong, near the school. Tony Price, Sek Kong School + Car. Please note Registration!! This magazine is an interesting and well produced history of the school and its garrison; full of articles and stories by ex-pupils, staff and parents, who lived in this almost last British outpost." The magazine is now stored in the BFES-SCE-Association's archives located at the IOE. 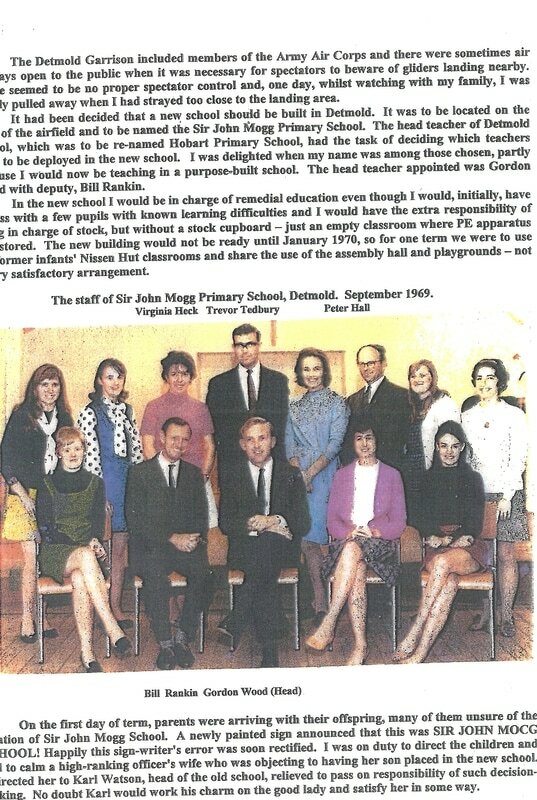 'The Army were desperate for someone to take on the task of founding this school.I applied, because I argued with my Director, BFES, Mr Pacey, who wanted to move the 11+ back by a full term at a Headteacher's meeting. Mr Buckley asked us all to give a vote of 'Yes' unanimously. I refused to do so since such a move of one full term would severely affect the results of the pupils who were less able, and would not therefore be able to pass, and thus gain the opportunity to go to a public school. The Director told me that I was 'A self opinionated bumptious young upstart.' I replied 'I have to agree with you Director'. In the event it never happened and he was big enough to congratulate me on my return. The children and staff of St. Clement's School, Wickrath celebrated the unveiling of the School Anchor on the 11th June 1987. The anchor which forms part of the School crest had been gifted by the Royal Navy. The anchor in the above photograph came from the submarine support vessel HMS Wakeful. This successful event followed two years of investigation by Mr Ian Gregson, Headteacher of St. Clement's School. To-day Queen’s School assembled in its permanent home. 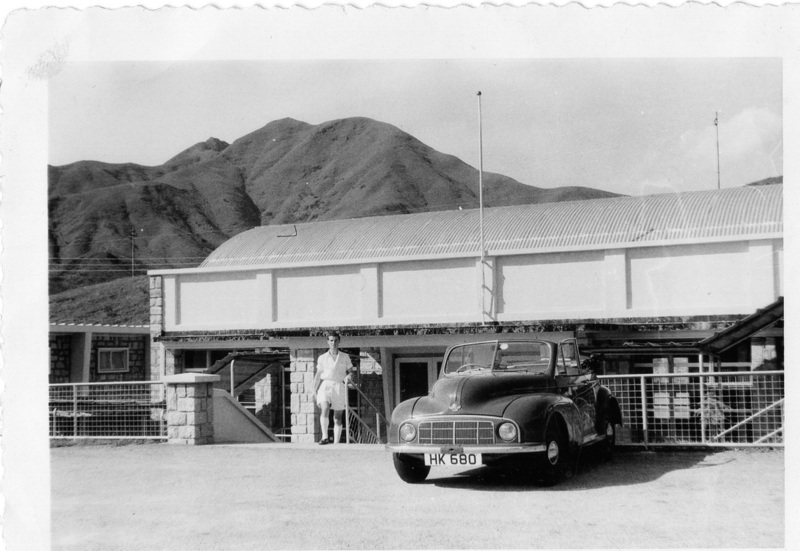 The building was scheduled to open in January 1955, and certain staff were appointed to commence duty in that month. This Queen’s Courier ran for many years and featured the life of the school through the fifties and sixties. 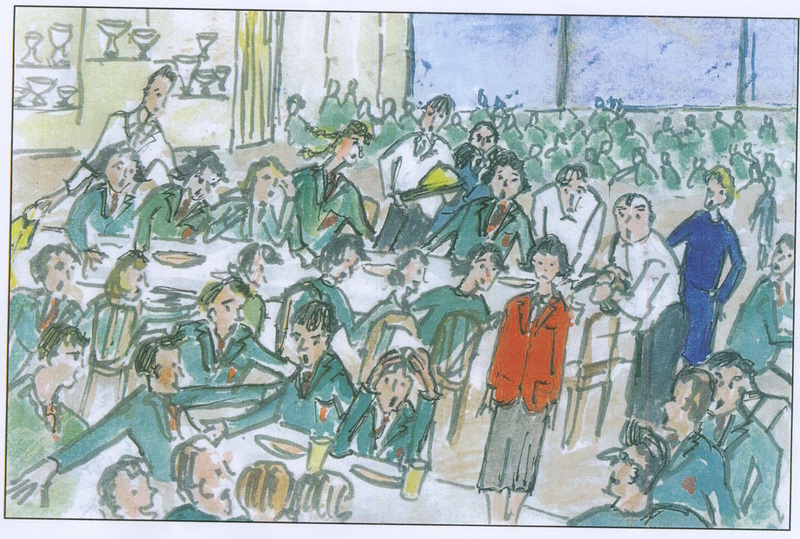 Reports of school visits, sports matches, house reports, academic achievement, speech day, notes of staff and student work all featured as the publication rapidly became part of Queens School tradition. ‘As I sit in the pleasant surroundings of a Queen’s School approaching its Silver Jubilee it is salutary to trace in outline how it has developed in the 25 years. In March 1987 the IRA planted and detonated a bomb close to the officers’ mess on JHQ. A number of windows in Chatham House were blown out as a result of the blast. Due to the heavy curtains being closed no-one was injured. As a result of falling numbers Queens and Kent School (Hostert) closed and were and retitled Windsor School. It took its name following the closure of the original SCE Windsor School in Hamm in 1985. Windsor School, Hamm itself was formed from the amalgamation of Windsor Boys School and Windsor Girls School both of which had existed in Hamm since the early 1950's. Jan 1956 – Dec 1959 Mr J V Taylor B.Sc, A.R.I.C. 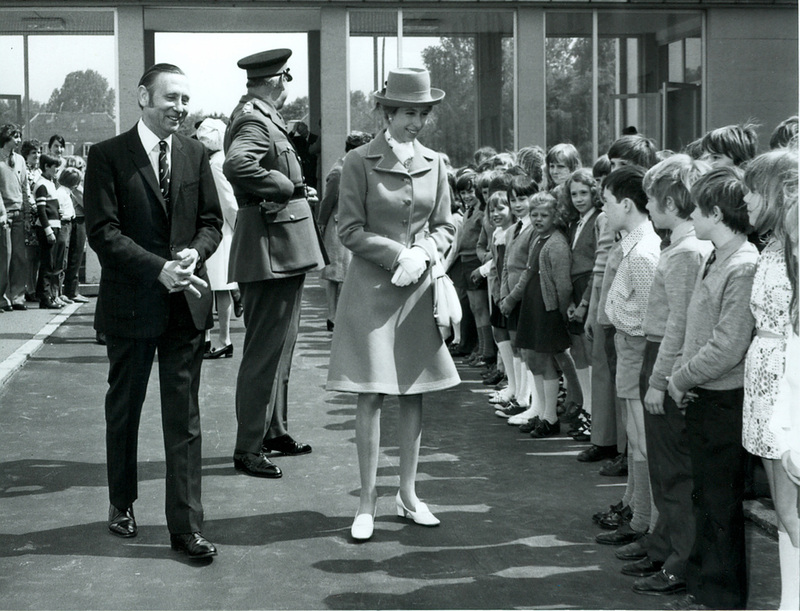 Although the new Windsor opened in September 1987 both sites were retained with Years 7, 8 and 9 on the Queens site and Years 10, 11 and Sixth Form on the Kent site. Many staff and students had to travel in order to meet their timetable requirements. Windsor School remains in the same grounds and building as the former Queens School but has received upgrades to its building, such as an expansion of its West wing. Options for Change (1991-1995) resulted in a reduction of Service personnel in BFG from 66,000 to 29,000, reducing the pupil population to approximately 10,000 of who 80% were primary. In January 1993, after lengthy consultation, ‘Schools for the Future 2’ was published, providing four secondary schools to cater for BFG. Gloucester, King’s, PRS and Windsor. The reduction in secondary provision and the closuschools in Berlin, Dortmund and Munster resulted in significant changes of staffing throughout the remaining secondary schools. "........of particular interest in the Archive is the collection of pupils' work. Archive collections tend to form the records of either organisations or individuals (adults) whose contribution to their field of work has been considered of great significance and therefore worthy of permanent preservation. As a result, the threat is that, the experience of the child becomes the 'lost voice' amongst the legacy of educational theory, policy and practice. 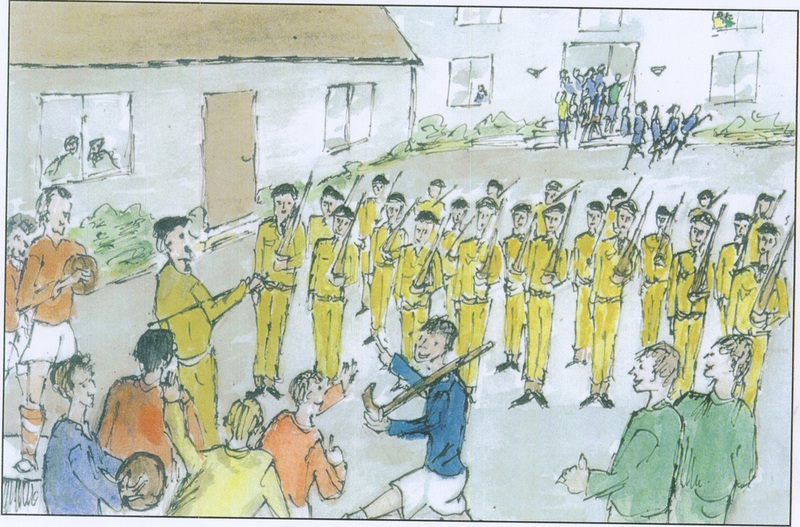 The BFES/SCE Association's archive contains school magazines, publicity material for school productions and even short videos showing school children recording a song for charity. Although they only provide a snapshot, through using such items we can start to gain a better understanding of the experience of the child - the factor which is ultimately the main motivation for those working and studying in the field of education". The Association is keen to build upon its Archives and additions can be made via the Association Archivist and through direct contact with the IoE. We would be pleased to receive memorabilia, memories, photographs, documents, Log Books and DVDs from present and past educationalists who serve or have served with BFES/SCEA/SCE. Between us all we must retain a vast quantity of material which will be of historical interest to future generations. Please search attics and storage areas for long-past or recent memorabilia and forward what you can to the Association. All contributions will be acknowledged and copies can be retained in Archives if originals are required back by donors. These photographs have been donated by David Arden who was the Deputy Headteacher and subsequently Acting Headteacher from 1968 tuntiol the School closed in July 1970. He was then appointed the following year as Deputy Headteacher of Highgate Hill School in Kuala Lumpur. 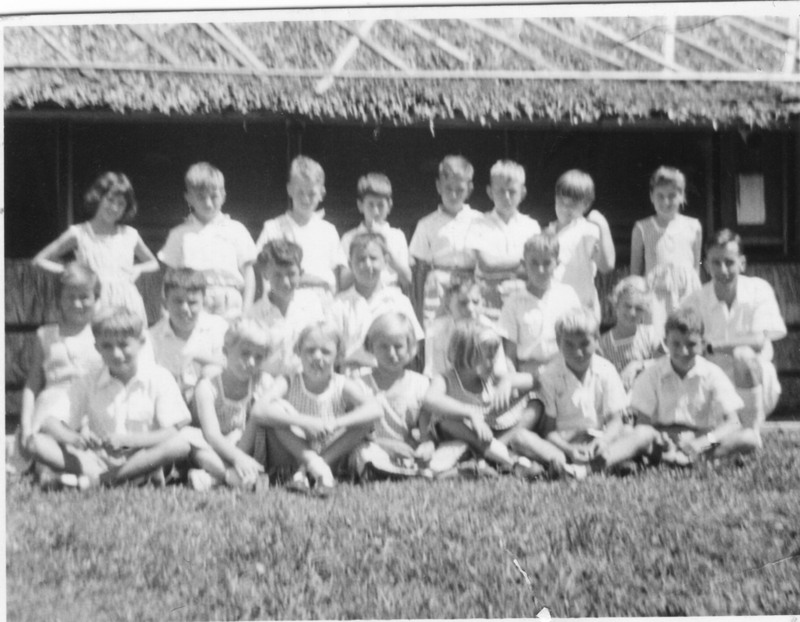 This photograph of a small Army Primary School (Three Teachers and 28 Pupils) in the tiny Malay island of Pulau Brani was sent to us by Lynne Copping. She was a pupil at the school from 1958 to 1961. 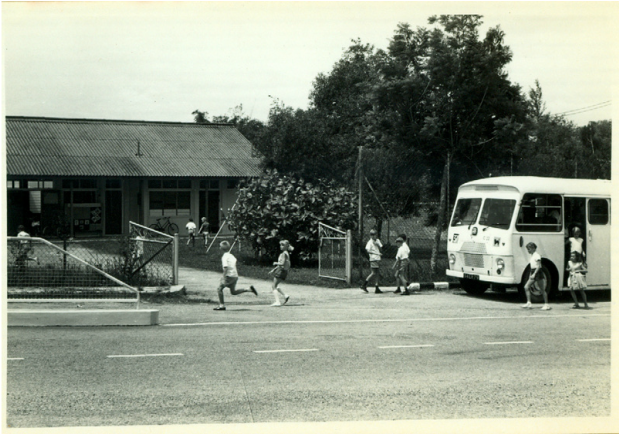 We believe that the school closed down in 1971 when the few remaining pupils transferred to Wessex school, Singapore. 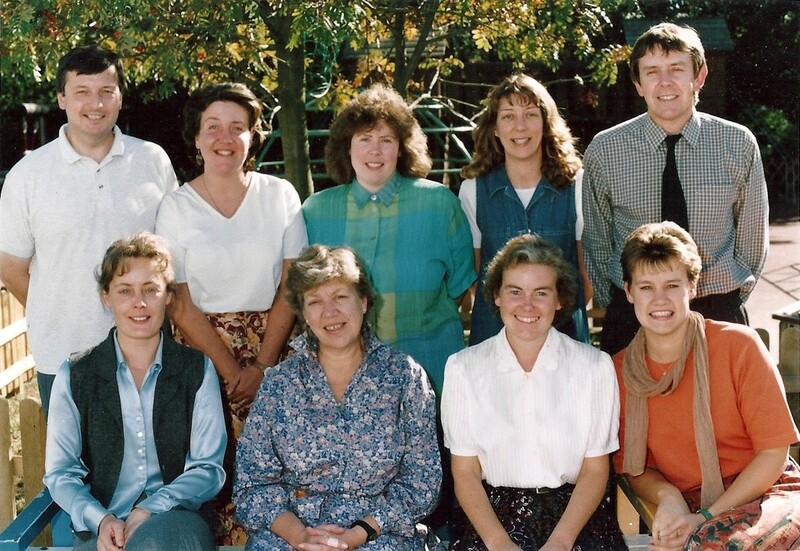 Wellington First School Osnabruck, West Germany - Staff Photographs. 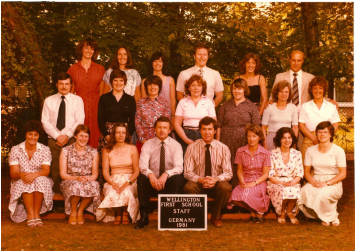 Images of Victoria School and staff - Dortmund Garrison Circa 1974 - 1978. 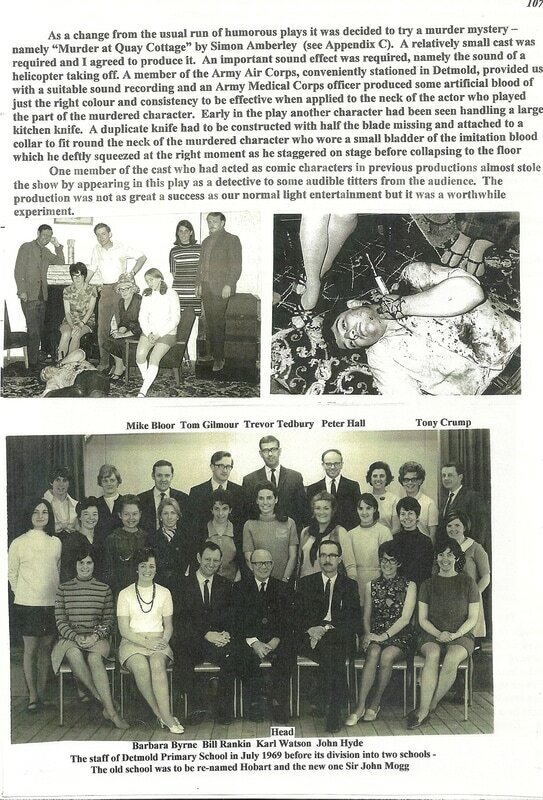 Sheila Robinson, Sandie Hall, Liz Eineson, Mike Metcalfe, Bob Steele, Jan Gwynnell, Anne?, Jenny?, ? 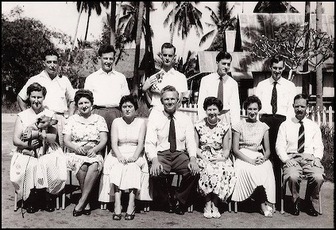 ?, Judith Collins, Chris Flather, Lesley?, Jackie Knight, Margaret Blair, Dee?, ? 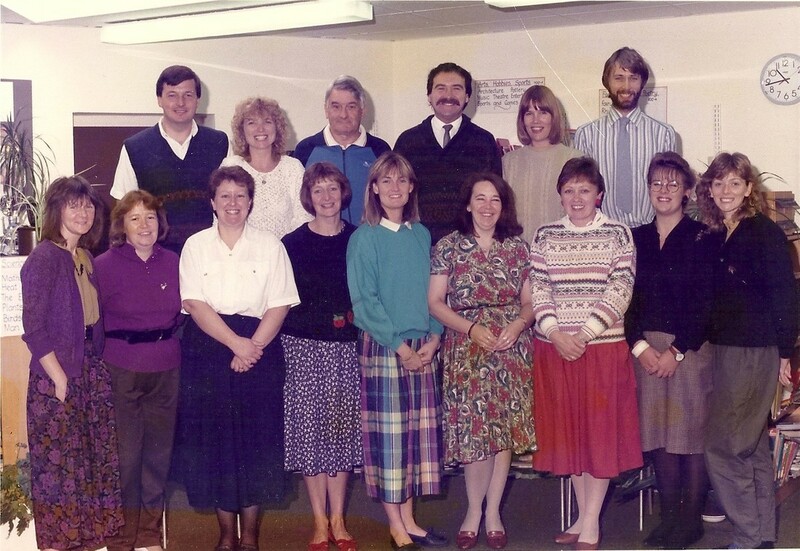 Katie Roberts, Judy Miller, Gareth Jones (DHT)Derek Spanner(HT), Jean Hardy, ? Teachers were keen participants in The Dortmund Theatre Club productions - one theory was that it was one way to get moved up the housing list for quarters as the club chairman was also SSO! ?? - ?? – Sybil ?? – Joe Eales – Colin Entiknap – Mary Lyons - ?? - ?? ?? – Mary Lyons - ?? – Janet Shocker? - ?? The original reel-to-reel version of this promotional film, showing the life and work of teachers and administrators with the British Families’ Education Service, is housed at the National Film Archive. A DVD version is held at the IOE but copies may be obtained from the Association’s Archivist at a cost of £5. All proceeds go the BFES/SCE Association’s funds. Below is a short 2 minute collection of clips from the original 20 minute reel to reel film.